These sweets that create a party in your mouth have been a favourite for many generations. Orange toffee chews that have a fizzy sherbet centre which explodes in your mouth, tingling those taste buds. Warning! 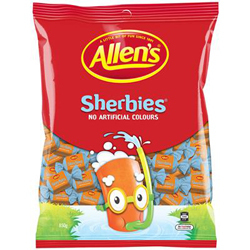 Don’t underestimate how much one of these little lollies will make your mouth water! Cane Sugar, Glucose Syrup (From Corn), Palm Oil, Food Acid (Tartaric), Mineral Salt (Sodium Bicarbonate), Flavour, Colours (Paprika Oleoresin, Carminic Acid), Vegetable derived Emulsifiers (Monoglyceride, Soy Lecithin).